I have had a love affair with the pickled egg ever since I saw a huge jar of them sitting on the counter of The Kitchen Bar in Belfast. This is/was your typical ‘old duffers’ pub where entering strangers would be met with Wild West gun-slinger squints from the smokey darkness. My reason for being in this place is entirely suspect but me and pickled eggs where on a destiny collison course. Me: What the frig are those things in the jar franks, pets!? Me: Pickles? What, did you pickle golf balls? Me: Pickeled eggs?! You trying to kill off you regulars? Me: (bite, squelch, swallow) Frank….I love you…. Do not burn the eggs. 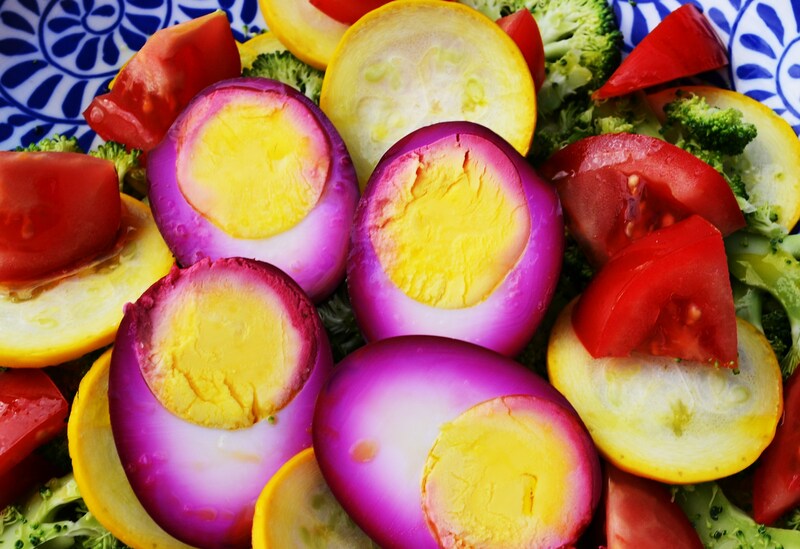 If your hard boiled egg has a grey film around it….burnt. So cook them using a timer – it’s the only way to do this with any exactness at all. Cool the eggs and peel under running cold water. If you want you can use a kilner jar for this – just transfer the pickling liquer to it, add the sugar then dump in the cooled eggs. Turn upside down a couple of times to ensure the beetroot juice covers the eggs entirely then leave to pickle up for about 2 days – any longer and the beet juice will stain the whole way through the yolk. That’s it – nothing new in terms of pickling but a very different twist on the styling! I’d make this for just to look at them, so pretty! Yeah, they’re a bit of a hoot!! I told my niece they were Dino eggs! Ahh hahahaha! Great post. Don’t “burn” the eggs! Frank you 🙂 the burnt egg is the solve reserve of the Petrol Station scotch egg! !